Widespread Panic has been together going on 30 years. Formed by original members vocalist/guitarist John “JB” Bell, bassist Dave Schools and late guitarist Michael Houser, who lived together in a suburban house in Athens, GA, where they met as students not far from the University of Georgia campus, later to be joined by drummer Todd Nance. Shortly after that, the band’s line-up was solidified with the addition of percussionist Domingo “Sunny” Ortiz and keyboard player John “JoJo” Hermann. Formed in the tradition of the great southern guitar blues bands, with an improvisatory ethos, Widespread Panic continue to explore a sound all its own on the band’s 12th album, Street Dogs, their first studio effort since 2010’s Dirty Side Down. When asked to describe Street Dogs, Widespread Panic’s debut album on Vanguard Records, JB references the way Dr. John describes the music scene in New Orleans as “a gumbo of musical influences.” JB cites Van Morrison and George Carlin as influences while Dave (Grateful Dead/Miles Davis), Mike (Emerson Lake and Palmer), Todd (Steely Dan), Sunny (Tito Puente), JoJo (classically trained with a love for Professor Longhair) and Jimmy (Beatles/ Mahavishnu Orchestra) all bring something different to the table. “Above all, after nearly thirty years together, we are arguably each other’s greatest influence,” JB concludes. That can be heard on the closing “Street Dogs for Breakfast,” a shaggy-dog country-blues that has a laid back sing-along, quality while “Cease Fire,” with its tribal percussion and bluesy guitars, addresses not only external warfare but the conflicts within, as the closing majestic Herring guitar solo embodies the smooth transition from words to a calming spirit of reconciliation. 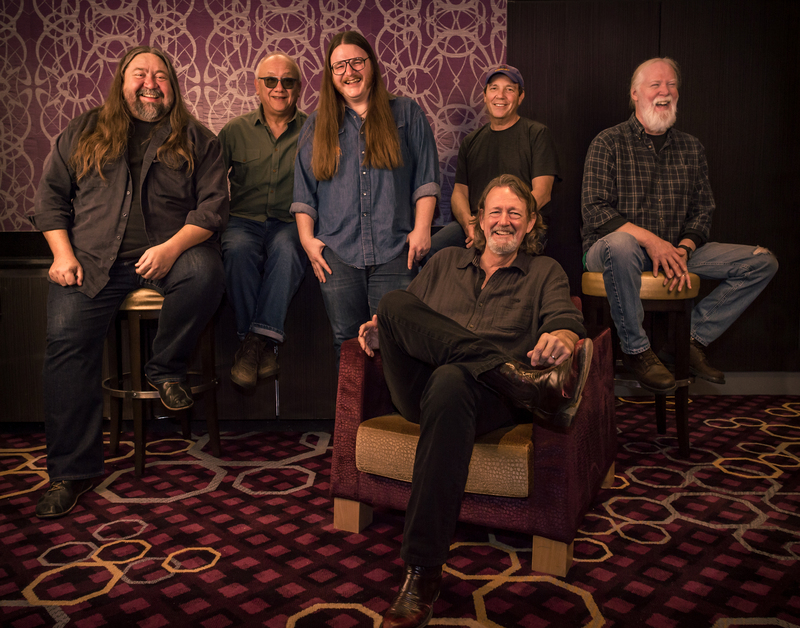 With next year marking three decades since forming their original line-up in 1986, Widespread Panic is still hungry to be the best band they can be, every single night, for their loyal fan base. Their accomplishments over that time are well-documented. During their impressive, now 30-year run, the band has released 12 studio albums (including Street Dogs) and 43 live albums, selling more than 3 million copies as one of the most successful touring acts in the world. Widespread Panic has broken attendance records at major venues throughout the country, including a staggering 48 sold-out shows at Red Rocks Amphitheatre in Morrison, Colorado. A banner hangs in the rafters at Philips Arena in Atlanta where the band has 18 sellouts, with records also set at Lakefront Arena in New Orleans, Oak Mountain Amphitheater near Birmingham, AL and the New Orleans Jazz and Heritage Festival where Panic has headlined eight times, breaking the single day attendance record with 63,000. The band has headlined most of the major U.S. festivals, including Bonnaroo (eight times), Lollapalooza, Austin City Limits, Lockn’ Music Festival, Outside Lands Music Festival, Forecastle Festival, Phases of the Moon, Rothbury Festival, All Good Music Festival, Gathering of the Vibes and many more. To commemorate Widespread Panic’s 25th anniversary in 2011, the State of Georgia’s Senate and House of Representatives passed resolutions honoring the group for their music, service, charity and longevity, while they were also inducted into the Georgia Music Hall of Fame. That’s as good a description of the way to approach Widespread Panic’s latest album as any.